When you visit breedyourdog.com or access the site through breedyourdog.co.uk you agree to be bound by the terms and conditions, as laid out on this page. We reserve the right to amend these terms and conditions at any time without prior notice. The updated version will be posted on the terms and conditions page of this website and you will be bound by the updated version if you continue to use the service thereafter. Our aim is to provide information in respect of any of the topics covered in this website, and whilst we, the owners of the website, make every effort to ensure that the information provided is correct, we cannot guarantee the authenticity or validity of the information and advertisements, nor that it is accurate, up-to-date and free of errors. Therefore, we accept no liability for any loss or damage (including any economic or consequential loss) arising as a result of interpretation, errors, misrepresentations, fraud or omissions in any of the information displayed on this site or accessed through it. We are not responsible for ensuring any transactions are completed. Our liability to you or any third party in any circumstance is limited to £100. We may copy and/or reproduce any information posted by you on this website in any form and at any time in any manner we wish. From time to time we may contact you to inform you of new services that we are offering on this website or to check the information you have posted on the website. You acknowledge and agree that any information you send or receive during your use of the site may not be secure and may be intercepted. We do not at any time possess the items, or dogs, offered through this website. You are solely responsible for information that you supply or place on this website. When listing a dog you undertake that you are legally able to advertise the dog/service or product in question and that all information posted by you is accurate, true, complete and not misleading and will be regularly updated by you so that it remains accurate, true, complete and not misleading. All photographs used on the web site must have the prior consent of the photographer. The advertiser is responsible for gaining any photographers approval prior to forwarding photographs to us to use on the web site. We cannot be held responsible for any issues arising due to copyright protection on photographs. You agree to remove listed dogs when you no longer wish to hear from potential breeders. If you do not remove this information within 24 hours we reserve the right to remove the information on your behalf. Puppy listings have a duration of six months, after this time they will automatically be removed. It is essential to the running of this website that you allow potential breeders to contact you. As such, you agree to supply us with a working email address and telephone number for us to use and disclose, to contact you to discuss the breeding of your dog or selling of your puppies. Although you are not obliged to breed your dog or sell your puppies to the viewer, you are obliged to respond to all enquiries. Any accounts with uncontactable or blocked email addresses or phone numbers will be deleted. We, the owners of this site, are not responsible for verifying an owners right to list a dog or litter or any information in the listings. By agreeing to these terms and conditions, you are confirming that you have not been, or are in the process of being, convicted of any offence under the Protection of Animals Acts 1911-2000.
post personal details such as telephone number, email address, fax number, mobile telephone number, postal address and/or postcode/zip code/facebook or any other social media sites or pages in your listings/profile/pictures or any other information which would enable another user to contact you directly. use this service to promote any other websites, or any other social media sites or pages, service or business in any way, including, but not limited to, posting the name of the business or websites, email address, address, fax number, mobile telephone number, postal address and/or postcode/zip code in your listings/profile/pictures. use this service to solicit another members business, advertise or buy and/or sell products and/or services through this website. in any way misuse this service and/or any information posted on this service. attempt to gain unauthorised access to any information available on, or via, the service, or to any of the networks used in providing the service. attempt to bypass our file validation checks. These checks are in place to ensure that no files of the wrong size or type are uploaded to our website. On completion of registration, you will be asked to supply a user name and password. You are responsible for all actions taken under that user name and password and shall only utilise the site using that user name and password. You must make every effort to keep your password safe and you should not disclose it to any other person. You acknowledge that other users will be able to view your dog's profile. Likewise, you will be able to view other dogs profiles. Your contact details will only be available to potential breeders who have already agreed to abide by these terms and conditions. We reserve the right to monitor and remove or amend any information posted by you on this site should it be deemed unsuitable. This includes information that may be menacing, abusive, defamatory, obscene, indecent or contrary to the terms and conditions listed on this page. We reserve the right to remove any account found with contact details that are incorrect. We reserve the right to remove multiple accounts for the same person. We reserve the right to terminate or suspend your account if we suspect that you have engaged in, or are about to engage in, fraudulent activity in connection with this website. In addition, we may limit your activity on this website by suspending or terminating your registration, and any of your listings, and refusing to provide any further services to you without prior notice if you breach these terms and conditions, or if we believe that your actions may cause us financial loss or legal liability. The website is not responsible for information posted on this website by other members. The website is merely providing a platform for members to post information and to allow you to make contact with other members through the use of this service, should you choose to do so. You should not assume that the information contained in any profile is correct and accurate. We, the website, do not have the resources or the opportunity to check that the profiles are correct and not misleading. Therefore we accept no responsibility for incorrect or misleading information contained within a dogs profile. By agreeing to these terms and conditions you agree to notify the breedyourdog.com administration team of any fraudulent activity or misrepresentation of information by any of its members. The main function of this service is to bring together members of this website who wish to breed their dogs. To cover development costs and ongoing running costs of this site, we must charge for the service. To contact the owner of a dog or litter listed on this site, credits must be purchased. Once an order for credits has been cleared by Paypal (our chosen payment gateway) an email will be sent to you confirming your order and the credit page of your account will be updated accordingly. Please note that credits cannot be transferred back into cash. Contacting another member through this website does not in any way guarantee a suitable match. Unless stated in this agreement, all monies paid by you are non-refundable. No members contact information will be supplied until payment has been made. All prices are quoted in and are payable in, US Dollars and GBP Sterling. We do not hold any credit card information. We use PayPal as our payment gateway and as such, they carry out all credit card processing. We do not see or store any payment details for the 12 month subscription period. Subscription payments are taken automatically by PayPal`s subscriptions system every 12 months for the subscription amount until the subscription is cancelled. Payments for any chargeable period are non-refundable. 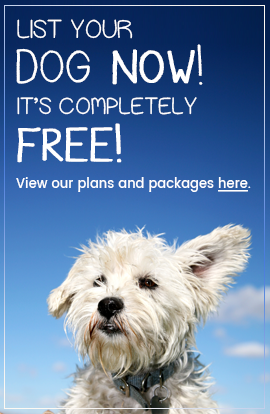 To cancel a subscription you must do so by logging into your PayPal account at http://www.PayPal.co.uk and select "Breed Your Dog [plan] - [price] / year". Subscriptions cannot be cancelled by us. breedyourdog.com may cancel an account including any live adverts regardless of any outstanding periods of paid membership without refund for any breach of these terms and conditions. Members will be given a 24-hour period to respond to any alleged breaches before all account privileges are suspended and if no contact is made within seven days all account details and adverts created by the member in breach of these terms will be removed from the website. By accepting this user agreement you agree that, with respect to other users personally identifiable information obtained through this website, you may only use such information for communications that are not unsolicited commercial messages and relate to your genuine participation in a transaction. In addition, you shall only use such information in accordance with applicable laws and regulations, including, without limitation, data protection and privacy laws. Under no circumstances, except as defined in this section, can you disclose personally identifiable information about another user to any third party without our consent and the consent of such other user after adequate disclosure. The information you supply and your contact details will be stated and processed on our computer in the United Kingdom in accordance with the Data Protection Act 1998. We will not be liable to you for any loss of information placed by you on the website, or purchases by you, or for the failure of the website that occurs due to any act or omission outside of our control. We exclude all implied warranties, conditions or other terms, including, without limitation, and any terms as to skill and care or timeliness of performance so far as the law allows. Due to the nature of the Internet, we do not provide any warranty or guarantee in respect of the service, its availability, and/or the uninterrupted use of the service. However, we will endeavour to rectify any serious faults as soon as is practical, though not within any specified time-scale. We reserve the right to suspend the service without notice for repair, maintenance or other technical reasons. Our services may not be used by persons under the age of 18 years. If you are registering your details as a business entity, you represent that you have the authority to bind that entity. This website, the information contained in it and transactions conducted through it shall be governed and construed according to the Laws of England and the parties hereto submit to the exclusive jurisdiction of the English Courts. You agree to indemnify and hold us harmless from any claim or demand, including legal fees, made by third parties due to, or arising out of, your breach of these terms or the violation of any law or the rights of a third party. These terms set forth the entire understanding and agreement between us with respect to its subject matter. If you do not agree to be bound by these terms and conditions, you may not use or access our services. All content Â© BreedYourDog 2006 - 2019 All Rights Reserved.